As most of you are aware I have been conducting various CIF bid surveys over the last week or so – bids for the government’s Condition Improvement Fund for Academies and Sixth Form Colleges. One of the most common features we come across in our inspections are stained ceiling tiles and stained plasterboard ceilings. What is causing these stained ceilings? Whilst the staining might appear to be simply cosmetic, it could be concealing something a lot more dangerous. In this post, I’ve put together some examples of my recent inspections to show you some of the likely causes. 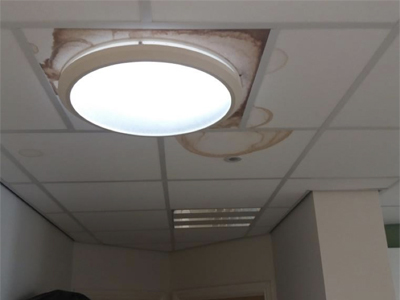 Failed Flashings – if the flashings around your flat roof or penetrations such as roof lights, windows or pipework have failed, this might cause small amounts of water to enter the roof space and stain the ceilings. Leaking pipework – many roof spaces are used for pipework for water supplies and heating. The water staining might simply be caused by a leak in the system. Overflows – equipment which uses water such as boilers, water tanks and cisterns might have overflows which indicate a problem with the equipment. 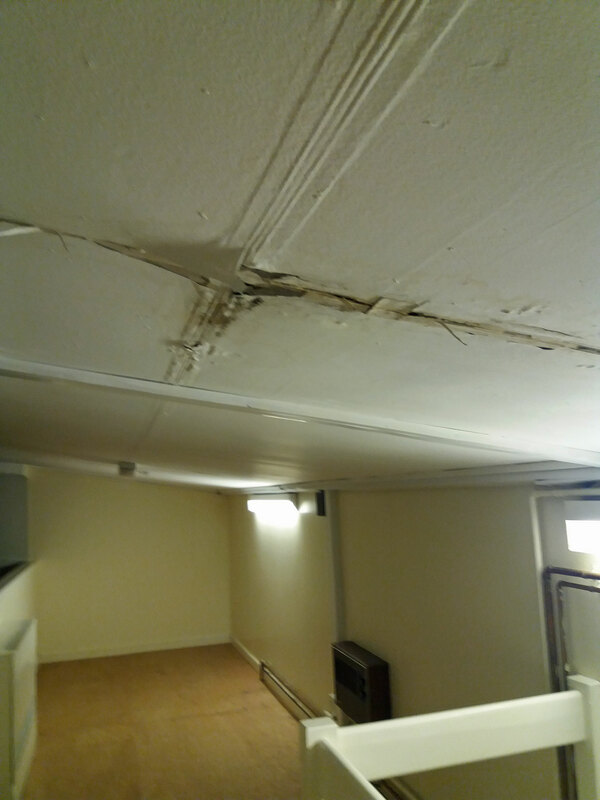 Some of these overflows might be housed within your roof space and be causing the stained ceiling. 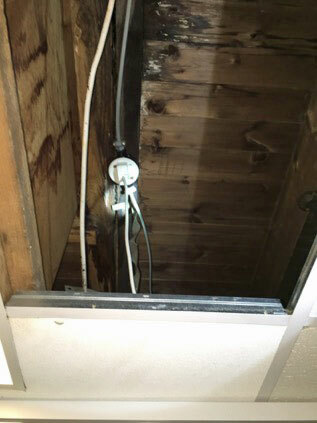 Blocked Outlets – if the outlets that direct rainwater off your roof are blocked, this might cause the water level to rise above the upstands and enter the roof space. A Failed Roof – the waterproofing on your roof itself might have failed, either through damage or having come to the end of its natural life. 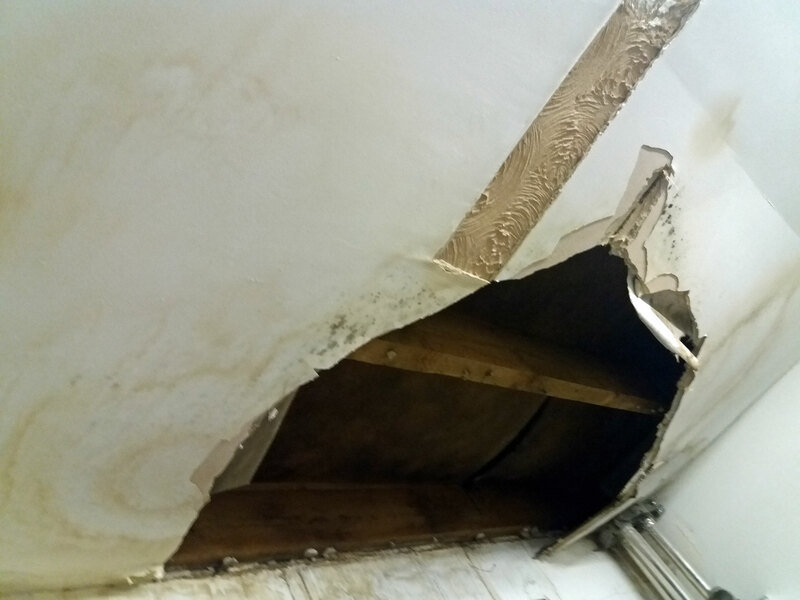 Interstitial condensation – water vapour from inside your school buildings may be condensing in a badly designed or badly installed roof, and this water may be leaking back into the ceiling void. The last two examples are particularly significant, because over time a large quantity of water can be involved. A failed roof or a badly designed one can cause a vast amount of damage and cost a lot of money to put right. Here are some examples of the results. 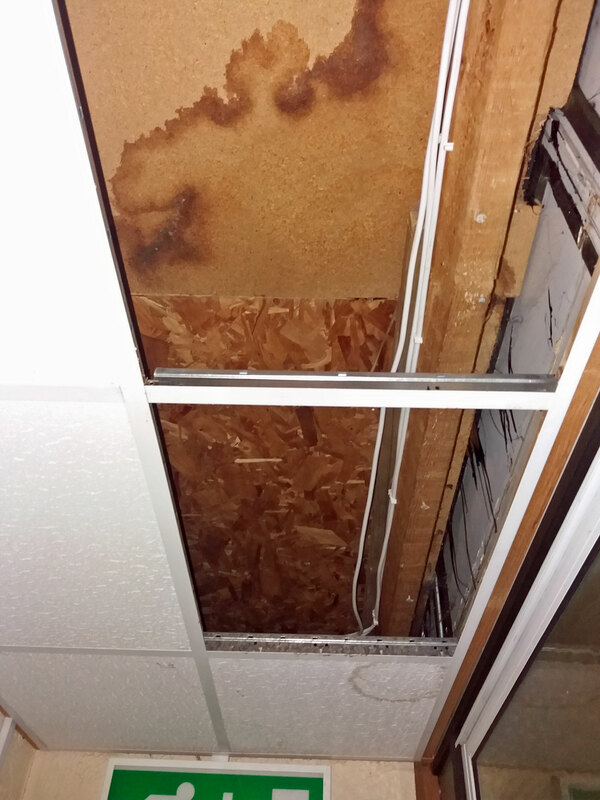 When we removed an area of ceiling you could see that the structural deck had completely failed causing a major risk to the children and teachers in the classroom below. This roof was so poor it would have been dangerous to walk on it. Water ingress from failed rooflight details, this is above a changing room. During periods of heavy rain there can be pools of water in the changing room! 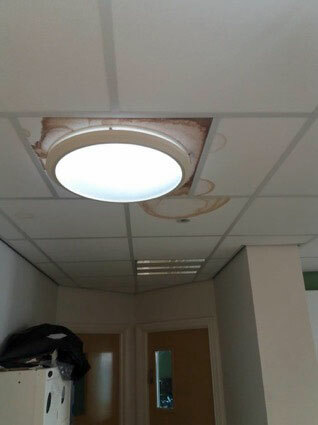 Whilst the first sign you’re likely to notice is staining on the ceiling tiles, don’t let the damage get to the point where there is a big hole. Unless the damage is inspected, it is very difficult to know what is the cause. Get an inspection of the damaged area and the roof above. We carry out such inspections for free. An inspection will identify the likely cause, and confirm whether you do need a survey of the roof (which we will also carry out for free). We also help make a CIF funding application for you if it is appropriate. You can find out about our free service here. Children spend more of their waking hours at school than at home – they shouldn’t have to spend them in an environment with dripping water and puddles, buckets on the floor and damaged ceiling tiles, when they are trying to learn. I believe our learning environment has a huge impact on us and if I was sat under these ceilings I would wonder if anyone cared. It really is frustrating seeing the condition of our schools, where our children are expected to learn, and teachers must work. The least they should expect is to be in a safe, clean and enjoyable environment. It doesn’t have to be like this, however. Funding is available to pay for repairs, and the school doesn’t have to pay for the inspection, specification and funding application support if you come to us. If you’ve got a stained ceiling, get in touch before it becomes a much bigger problem.